طاهرخانی, حسن, ارشدی, محمد‌رضا. (1397). مقایسه تاثیر استفاده از پلیمر ضایعاتی پلی‌اتیلن ترافثالات PET)1) بر‌عملکرد بتن آسفالتی حاوی قیر اصلاح نشده و اصلاح شده با لاستیک ضایعاتی. پژوهشنامه حمل و نقل, 15(4), 347-361. حسن طاهرخانی; محمد‌رضا ارشدی. "مقایسه تاثیر استفاده از پلیمر ضایعاتی پلی‌اتیلن ترافثالات PET)1) بر‌عملکرد بتن آسفالتی حاوی قیر اصلاح نشده و اصلاح شده با لاستیک ضایعاتی". پژوهشنامه حمل و نقل, 15, 4, 1397, 347-361. طاهرخانی, حسن, ارشدی, محمد‌رضا. (1397). 'مقایسه تاثیر استفاده از پلیمر ضایعاتی پلی‌اتیلن ترافثالات PET)1) بر‌عملکرد بتن آسفالتی حاوی قیر اصلاح نشده و اصلاح شده با لاستیک ضایعاتی', پژوهشنامه حمل و نقل, 15(4), pp. 347-361. طاهرخانی, حسن, ارشدی, محمد‌رضا. مقایسه تاثیر استفاده از پلیمر ضایعاتی پلی‌اتیلن ترافثالات PET)1) بر‌عملکرد بتن آسفالتی حاوی قیر اصلاح نشده و اصلاح شده با لاستیک ضایعاتی. 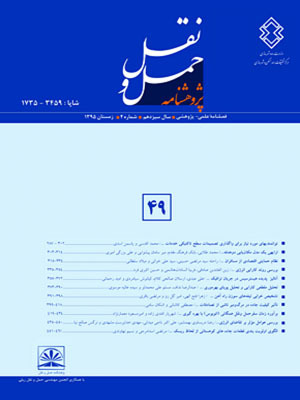 پژوهشنامه حمل و نقل, 1397; 15(4): 347-361. ترکیب‌های مختلف، مخلوط‌های آسفالتی حاوی PET، تحت آزمایش‌های مارشال، کشش غیرمستقیم و خزش دینامیکی قرار گرفتند. آزمایش خزش دینامیکی با استفاده از دستگاه UTM-10، در سطح تنش 300 کیلوپاسگال و دمای 40 سانتی‌گراد، به منظور ارزیابی تغییر شکل ماندگار (شیار افتادگی) مخلوط‌ها به کار گرفته شد. نتایج نشان داد که اضافه کردن PET به مخلوط‌های آسفالتی حاوی قیر لاستیکی باعث بهبود مقاومت مارشال و نسبت مارشال نسبت به نمونه شاهد شد، به‌طوری‌که بیشترین مقدار مقاومت و نسبت مارشال مربوط به نمونه‌های حاوی 10 درصد PET شد. اما، در مخلوط آسفالتی حاوی قیر اصلاح نشده ببشترین استقامت و نسبت مارشال با افزودن 4% PET حاصل می گردد. همچنین، نتایج آزمایش کشش غیرمستقیم بر روی نمونه های حاوی درصد فضای بین 5/6 تا 5/7% نشان داد که بیشترین استقامت در هر دو مخلوط با افزودن 2% PET به دست می آید، اما، در مخلوط‌های حاوی درصد فضای خالی در محدوده 3 تا 5% مقاومت کششی با افزایش PET کاهش می یابد. نتایج آزمایش خزش دینامیکی نشان داد که مخلوط‌های آسفالتی گرم حاوی PET رفتار متفاوتی در برابر بارگذاری دینامیکی نسبت به استاتیکی دارند. افزودن PET به مخلوط‌های آسفالتی باعث کاهش مقاومت نسبت به تغییر شکل دائمی (شیار افتادگی) تحت بارگذاری دینامیکی شد، به‌طوری‌که با افزایش مقدار PET مقاومت نسبت به تغییر شکل دائمی کاهش یافت. اما، تاثیر PET بر مقاومت شیار شدگی مخلوط حاوی قیر لاستیکی کمتر از آن بر مخلوط حاوی قیر اصلاح نشده است. In this research, in order to study the effect of using PET on the performance of asphalt concrete containing rubber modified and unmodified binder, PET particles were added into the mixtures in different dosages of 0, 2, 4, 6, 8 and 10% (by the weight of binder). After determination of the optimum binder content of the mixtures, the specimens were made and subjected to Marshall, indirect tensile and dynamic creep tests. The dynamic creep tests were performed using a universal testing machine (UTM-10) by applying a vertical stress of 300kPa at a temperature of 40°C, to investigate the resistance against permanent deformation. Results show that adding PET into the mixtures improves the Marshall stability and Marshall Quotient compared with those for the control mixture. However, the trend of variation with PET content is different for the unmodified and rubber modified mixtures. While the Marshall stability and Marshall quotient increase with increasing PET content in the rubber modified asphalt concrete, they reach to the highest value by adding 4% of PET into the unmodified mixture, and after that they decrease with increase of PET content. The indirect tensile test results show that the indirect tensile strength (ITS) of the mixtures made by rubber modified and unmodified binder and containing air voids content within 6.5 to 7.5%, reaches to its highest value by adding 2% of PET. However, for the mixtures containing air voids content within 3-5% ITS decreases with increasing PET content. Dynamic creep tests reveal that the resistance against permanent deformation decreases with increasing PET content in both mixtures, with a lower reduction in the mixtures made by rubber modified binder. Comparing the results of Marshall Quotient and dynamic creep tests show that the deformation behavior of PET modified mixtures is different under static and dynamic loading. While, the mixtures resistance against deformation under static loading is improved, under dynamic loading they show less resistance than the control mixtures. Also, results of this research show that PET is less effective on the rubber modified mixtures than the unmodified mixtures. -Abtahi, S.M., Sheikhzadeh, M. and Hejazi, S.M. )2010(, “Fiber-reinforced asphalt-concrete–a review”, Construction and Building Materials, Vol. 24, No. 6, pp. 871-877. -Ahmadinia, E., Zargar, M., Karim, M. R., Abdelaziz, M., & Shafigh, P. (2011), “Using waste plastic bottles as additive for stone mastic asphalt”. Materials & Design, Vol. 32, No. 10, pp. 4844-4849. -Arabani, M., Mirabdolazimi, S. M., & Sasani, A. R. (2010), “The effect of waste tire thread mesh on the dynamic behaviour of asphalt mixtures”. Construction and Building Materials, Vol. 24, No. 6, pp. 1060-1068. -Ahmed, I. (1993), “Use of waste materials in highway construction”, USA: Noyes Data Corporation. -Ameri, M., Mansourian, A., & Sheikhmotevali, A. H. (2013), “Laboratory evaluation of ethylene vinyl acetate modified bitumen’s and mixtures based upon performance related parameters”. Construction and Building Materials, Vol. 40, pp. 438-447. -Ameri, M., Hesami, S. and Goli, H. (2013), “Laboratory evaluation of warm mix asphalt mixtures containing electric arc furnace (EAF) steel slag”. Construction and Building Materials, Vol. 49, pp. 611-617. -Baghaee Moghaddam, T., Soltani, M., & Karim, M. R. (2014), “Evaluation of permanent deformation characteristics of unmodified and Polyethylene Terephthalate modified asphalt mixtures using dynamic creep test”. Materials & Design, Vol. 53, pp. 317-324. -Baghaee Moghaddam, T., Karim, M.R. and Abdelaziz, M., (2011), “A review on fatigue and rutting performance of asphalt mixes”. Scientific Research and Essays, Vol. 6, No. 4, pp. 670-682. -Baghaee Moghaddam, T., Soltani, M. and Karim, M.R., (2014), “Experimental characterization of rutting performance of polyethylene terephthalate modified asphalt mixtures under static and dynamic loads”. Construction and Building Materials, Vol. 65, pp. 487-494. -Baghaee Moghaddam, T., Karim, M. R., & Syammaun, T. (2012), “Dynamic properties of stone mastic asphalt mixtures containing waste plastic bottles”. Construction and Building Materials, Vol. 34, pp. 236-242. -Chen, H., Xu, Q., Chen, S. and Zhang, Z. (2009), “Evaluation and design of fiber-reinforced asphalt mixtures”. Materials & Design, Vol.30, No. 7, pp. 2595-2603. -Cong, P., Xun, P., Xing, M., & Chen, S. (2013), “Investigation of asphalt binder containing various crumb rubbers and asphalts”. Construction and Building Materials, Vol. 40, pp. 632-641. -Earnest, M. D. (2015), Performance Characteristics of Polyethylene Terephthalate (PET) Modified Asphalt. (Master’s thesis), Georgia Southern University, United States. -González, V., Martínez-Boza, F. J., Gallegos, C., Pérez-Lepe, A., & Páez, A. (2012), “A study into the processing of bitumen modified with tire crumb rubber and polymeric additives”. Fuel processing technology, Vol. 95, pp. 137-143. -González, V., Martínez-Boza, F. J., Navarro, F. J., Gallegos, C., Pérez-Lepe, A., & Páez, A. (2010) “Thermomechanical properties of bitumen modified with crumb tire rubber and polymeric additives”. Fuel Processing Technology, Vol. 91, No. 9, pp. 1033-1039. -Huang, B., Mohammad, L., Graves, P., & Abadie, C. (2002)­,“Louisiana experience with crumb rubber-modified hot-mix asphalt pavement”. Transportation Research Record: Journal of the Transportation Research Board, Vol.1, No. 1789, pp. 1-13. -Kim, H. H., & Lee, S. J. (2015), “Effect of crumb rubber on viscosity of rubberized asphalt binders containing wax additives”. Construction and Building Materials, Vol. 95, pp. 65-73. -Katman, H.Y., Ibrahim, M.R., Karim, M.R., Salim Mashaan, N. and Koting, S. (2015), “Evaluation of Permanent Deformation of Unmodified and Rubber-Reinforced SMA Asphalt Mixtures Using Dynamic Creep Test”. Advances in Materials Science and Engineering. vol. 2015, Article ID 247149. -Lastra-González, P., Calzada-Pérez, M. A., Castro-Fresno, D., Vega-Zamanillo, Á. & Indacoechea-Vega, I. (2016), “Comparative analysis of the performance of asphalt concretes modified by dry way with polymeric waste”. Construction and Building Materials, Vol. 112, pp. 1133-1140. -Lee, S. J. (2007), “Characterization of recycled aged CRM binders” (Doctoral dissertation, University of Clemson). Martinez-Echevarria, M. J. (2012), “The mechanical performance of dry-process crumb rubber modified hot bituminous mixes: The influence of digestion time and crumb rubber percentage”. Construction and Building Materials, Vol. 26, No. 1, pp. 466-474. -Moreno, F., Sol, M., Martín, J., Pérez, M., & Rubio, M. C. (2013), “The effect of crumb rubber modifier on the resistance of asphalt mixes to plastic deformation”. Materials & Design, Vol. 47, pp. 274-280. -Modarres, A., & Hamedi, H. (2014a), “Effect of waste plastic bottles on the stiffness and fatigue properties of modified asphalt mixes”. Materials & Design, Vol. 61, pp. 8-15. -Modarres, A., & Hamedi, H. (2014b), “Developing laboratory fatigue and resilient modulus models for modified asphalt mixes with waste plastic bottles (PET)”. Construction and Building Materials, Vol. 68, pp. 259-267. -Presti, D. L. (2013), "Recycled tyro rubber modified bitumen’s for road asphalt mixtures: A literature review" Journal of Construction and Building Materials, Vol. 49, pp. 863-881. -Rodríguez-Alloza, A. M., Gallego, J., Pérez, I., Bonati, A., & Giuliani, F. (2014), “High and low temperature properties of crumb rubber modified binders containing warm mix asphalt additives”. Construction and Building Materials, Vol. 53, pp. 460-466. -Shen, J. N., Xie, Z. X., Xiao, F.P. and Fan, W.Z. (2012) “September. Evaluations of Nano-Sized Hydrated Lime on the Moisture Susceptibility of Hot Mix Asphalt Mixtures”. In Applied Mechanics and Materials, Vol. 174, pp. 82-90. -Shen, J., Amirkhanian, S., Lee, S. J., & Putman, B. (2006) “Recycling of laboratory-prepared reclaimed asphalt pavement mixtures containing crumb rubber-modified binders in hot-mix asphalt”. Transportation Research Record: Journal of the Transportation Research Board, Vol.1, No. 1962, pp. 71-78. -Tang, N., Huang, W., & Xiao, F. (2016), “Chemical and rheological investigation of high-cured crumb rubber-modified asphalt”. Construction and Building Materials, Vol. 123, pp. 847-854. -Wong, C. C., & Wong, W. G. (2007), “Effect of crumb rubber modifiers on high temperature susceptibility of wearing course mixtures”. Construction and Building Materials, Vol. 21, No. 8, pp. 1741-1745. -Xiao, F., Amirkhanian, S. N., Shen, J., & Putman, B. (2009), “Influences of crumb rubber size and type on reclaimed asphalt pavement (RAP) mixtures”. Construction and Building Materials, Vol. 23, No. 2, pp. 1028-1034. -Xiao, F. (2006), “Development of fatigue predictive models of rubberized asphalt concrete (RAC) containing reclaimed asphalt pavement (RAP) mixtures” (Doctoral dissertation, University of Clemson). -Xu, O., Xiao, F., Han, S., Amirkhanian, S. N., & Wang, Z. (2016), “High temperature rheological properties of crumb rubber modified asphalt binders with various modifiers”. Construction and Building Materials, Vol. 112, pp. 49-58.